Translated from the Chinese by Conor Stuart. This is a short story taken from City of Tears (哭泣哭泣城 kuqi kuqi cheng, 2002) by Roan Ching-yue (阮慶岳) , an architect and professor based in Taipei. He arrived in Hanoi in the afternoon. He didn’t know what to do, so he just wandered around the busy districts and the little alleys near Hoan Kiem Lake, buying a few things for the sake of it, then an old opera house building towering at the end of the street drew him over; there were people queuing up to buy tickets at the booth, he approached and asked a woman what was going on, she said it was an event celebrating the fortieth anniversary of something, and that there was an opera performance from Paris, she said it would be really good and that he shouldn’t miss it. There was still some time remaining after he’d bought the ticket, and after turning a few corners he came across a beer garden where he sat down to order a drink; there were a few western patrons scattered throughout the bar, mostly in couples or in groups, he was sitting alone, feeling a strange unsettling feeling of not knowing where to direct his gaze. He was still unable to convince himself that he was already here in Hanoi, or indeed of the reasons why he had come, it didn’t seem that this was the course his life should be running, but he really sitting here now, it was strange but inescapable. The sky darkened suddenly, he paid the bill and then made his way gradually back to the opera house. Along the road there were young pedlars, one of them wouldn’t go away and followed him through a few alleys, a beggar woman urged her daughter, who couldn’t have been older than three or four years old, to hold on tight to his trouser leg; this all made him rather uncomfortable, he had a french opera to enjoy, if only these people, the onslaught of which he was helpless against, would stop appearing in front of him, in the square in front of the opera house he could still see the young policeman standing at attention, indifferently looking on without seeing, he even began to feel resentment against the Vietnamese government for allowing these two completely different worlds to coexist, such inappropriate neighbours with no way to avoid clashing. The opera was the story of the harper Orpheus of Greek legend, the gods when they saw how grief-stricken he was on the death of his wife, allowed him to enter the underworld and bring her back, he was unable to resist looking back however, and in the end he lost her once again; the moving song of Orpheus resounded in the grand, magnificent halls, inspiring grief in every ear. He left the opera house and descended a long extravagant staircase and then quickly entered the alley opposite, all alone he felt a sense of emptiness and dejection; a few taxis stopped for him and tried to get him to get in, but he felt like a quiet night walk, so he brushed them away. He strolled onward, the curious onlookers squatting in the darkness at the edges of the road gradually dwindled as he progressed through the alley, he wasn’t sure where he was heading, he looked all around him but the taxis who had hassled him earlier were now nowhere to be seen, terror and fear gradually creeped up in him; he moved to the centre of the road where the lights were brightest, and his pace quickened subconsciously , as if at any second some unknown threat would emerge from the little alleys on both sides of the street. He turned around to look, there was a sun-darkened face flashing a smile that revealed bright white teeth. He hesitated for a moment, but to his surprise he felt completely disarmed almost instantly, and it felt like the most natural thing in the world to straddle the back of the bike; the young motorcyclist studied the hotel card that he passed him, then nodded and gestured that he was going to start the engine. After a few turns they were back on the main street which was still bustling, and except for the guy hammering on the horn, they remained in silence. His right hand was clasped around the guy’s thin but evidently strong waist, his eyes drifting over the various street scenes as they passed, a sadness rushed over him again, it was like the loneliness of a ship-hand who has lost his way in the night. The guy’s attention was still focused on driving, the sounds of the horn swelled and dissipated at intervals, apparently insensitive to the waves of emotion that were hitting him, the warmth of his stomach was accompanied with the slowing frequency of his breathing, as if he was whispering something to him through the hand that connected them. He asked him out of the blue while waiting at a red light; the way he turned his head made him think of the opera, when Orpheus can’t resist the mournful pleas of his wife and looks back, on the very threshold of the underworld. The young rider repeated the question back to him in a mumble, nodded and left. Although he was sad as he drifted off to sleep, he felt a touch of anticipation at meeting the young rider again the next day. The next morning, when he walked out of the hostel he didn’t see him and panicked. He saw the white muggy sky, and felt a bit dizzy and didn’t know where he should go, the doorman tried to help out by asking him if he needed a taxi, he shook his head and walked down the ramp. Why hadn’t he turned up as promised? Was it because he had refused the massage? Standing alone on the footpath at the edge of the road he put on his sunglasses frantically, then suddenly, as he raised his head, he caught sight of him standing under a tree at the far side of the road, talking to another driver. Just then he turned and saw him too, then hurriedly put out his cigarette and pushed his bike over, he had a layered apologetic smile on his face; he continued to stare at his expression, worried that he might reveal to him the inner joy and insecurity that he felt. He laughed along with him, shrugged his shoulders and straddled the back of the motorbike. When the bike started moving, he put his arm around his warm waist once more, feeling him tremble slightly at his touch. The first place they arrived was the Ho Chi Minh Mausoleum. The park was vast and bright under the scorching sky, he took him around and around the same roads, he seemed to be a little agitated because he couldn’t find the right entrance to the tombs. He wasn’t really sure how keen he actually was to see the body of Ho Chi Minh, no matter how a body died, it was always a little stomach-turning, but he didn’t know if refusing would frustrate him further or even embarrass him. In the end, he asked a guard, who told him that it didn’t open until Sunday morning, the next day, after that they both relaxed a little, they slowed their pace and strolled around the park, and got their first chance to have a proper conversation. He asked him what his name was? He didn’t seem to understand what he’d said, and gave an unrelated reply. The two of them fell into silence. After a while he asked him where he was from. He looked at him a little startled, and then paused for a long while. He didn’t understand his reaction, so he turned his head in the other direction, there was a group of soldiers doing their morning exercises on the lawn. The young soldiers would cast glances towards the tourists who were weaving their way through their midst, at times, pausing to joke around with one another. They found it hard to talk to one another, but he gradually put together a clearer portrait of the young man; he had come from the countryside north of Hanoi to earn money, “It’s been one year… Another year and I’ll go home… mother is waiting for me… she’s 80 years old… I’ve also got a wife and a child… he’s a one year old… I will go back to work the fields in one year.” When he talked about working the field he mimed cutting rice stalks, and a smile blossomed on his face. When they got back on the bike, it seemed as their bodies had become more relaxed with one another because of the conversation they’d just had, when he pressed the brake pedal, their bodies pressed together, after which they didn’t make any active effort to move apart again. The second tourist spot they arrived at was the Military Museum, he guessed that the guy had seen him staring at the soldiers just now, and that had led him to guess at where his interests might lie; he actually had little interest in the successes, the defeats, the scars and the loss of war, and he found it hard to countenance photographs of lots of people hurting and hating each other, so he passed through quite hastily; his mind was still on the merry young soldiers from that morning, why hadn’t that scene inspired in him the same associations? Was it their youthful beauty that had obscured the cruel ugliness of it all? When the time came would they too kill people like the Americans and the Viet Kong in the movies? He saw that he was dwelling in front of an old military map, so he went back and gave him a questioning look, he gestured at the map with his finger, pointing at what must be his hometown. He stared vacantly at the area north-west of Hanoi at which he was pointing, he was unable to imagine what it looked like, he mimed cutting rice stalks once more, saying… ten days… Then he mimed riding a motorcycle, saying four hours; he guessed that he was trying to say that in ten days he would go back to his hometown to help with the rice harvest and that it took four hours by motorbike to get there. After leaving the museum they went to eat lunch together, as they were eating he brought up the four hours again, saying that most people had to spend five hours going home, with a look of almost childlike glee. After eating, they went to a park with a bigger lake in the area just south of the city. The ancient-looking trees in the park towered up into the sky, and there was no-one except a few couples in their shade; it was extremely quiet as they walked along the path beside the lake, their exposed arms casually brushed up against each other as they walked, which unleashed a quiet but acute tension between them, desire throbbed within him, so he called him to sit on a bench by the water. When he returned to his hotel room alone, he turned on some music and then took a beer into the bath with him, to wait for Nguyên to make an appearance. Nguyên, however, didn’t show up. He was as annoyed as he had been when he thought he had stood him up that morning. When he was sure that Nguyên wasn’t coming, he lay down naked on his bed, both eyes fixed on the ceiling, one of his hands roaming on his flabby stomach, the other grasping below, rubbing rhythmically… Nguyên wasn’t going to show up. The light from outside his window gradually faded, and the room seemed extremely quiet, making him think his gradually deepening moans could be heard clearly. At the time he hadn’t know what to say, so he just said that the memory sounded like a dream, he remembered the hurt expression that had revealed itself on his face, a look of not feeling confident in one’s own memories. When he went down to the lobby again, it was eerily empty, a beautiful chandelier hung at its centre, like a beautiful, ornately clad lady, standing helplessly alone on the dance floor; He looked down on the street outside, it was completely dark and there was a faintly dangerous air that something strange was going on, he couldn’t quite put his finger on what it was though, there was nothing in view that gave him any clue, which made him more apprehensive about going out of the hotel. He took a seat at the bar at one side of the lobby, the barmaid poured him a whiskey on the rocks, and he sat there vacantly, sipping his drink; What was he doing now in Taipei? Is he thinking about me right now? Is he mad because I up and left to go travelling? How will we get back in touch once I get back to Taipei? He turned around to see it was the concierge, in his hand he held a plastic bag. He didn’t reply and just took the bag, he looked inside, there were some crumpled up newspapers, but he didn’t see any kind of message left for him, which left him feeling a little disappointed. He continued to sip at the whiskey, wondering if he would see Nguyên again tomorrow before he left. Slightly troubled, he finished the whiskey in his glass; his feet took him without any clear sense of direction into the dark street outside. Did Nguyên’s girlfriend betray him? Was she happy after marrying the old Taiwanese man? Does she still miss him? If I suddenly decided to fall in love with a Vietnamese person and stay here, would he get angry in Taipei and start hitting people? Would he become a source of guilt and regret for me for the rest of my life? The darkness of the street was colder than he had expected, he wrapped his arms around himself and moved along the street; then he heard the familiar sound of a motorbike engine approaching from behind. It was him, it was him, it must be him, he told himself, the feeling of excitement and expectation rising in him was hard to conceal. It actually was Nguyên, appearing with the same bearing as when they had first met; he didn’t know what to say, so he just stared at him smiling with unconcealed joy. Nguyên just gestured to him blankly to get on the bike. They then flew into the alleys and streets. Bizarrely the whole city centre was packed with pedestrians, despite the time, so they quickly got held up in the crowd, most of the people crisscrossing their way through the streets were well-dressed and in high spirits; he asked Nguyên why this was, Nguyên gave a simple explanation but he couldn’t completely understand, it was national day or some special holiday the next day, so all the young people were out and about with their companions. In the end they decided to park the bike and walk. 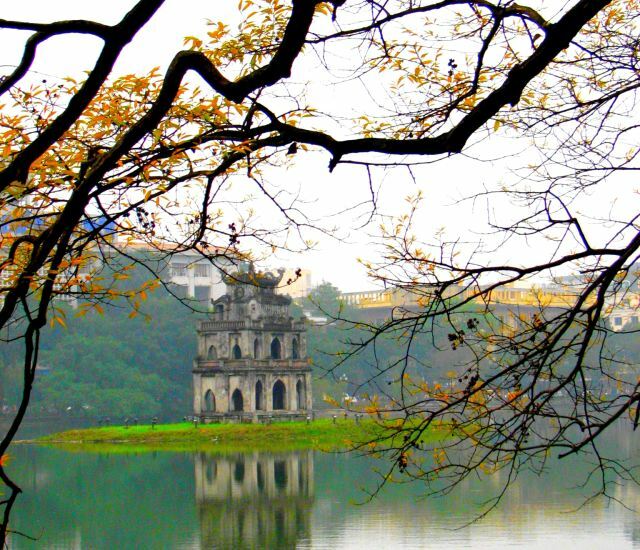 He followed Nguyên as he weaved his way around Hoan Kiem Lake where he’d come yesterday when he’d just arrived. Just then he remembered something he’d read on the plane on the way here about the lake, about a Vietnamese folk hero who had returned his beloved sword to the god of the lake after successfully fending off an attack from the North by the invading Han Chinese army; he wanted to ask Nguyên what he thought of Han Chinese people, or Taiwanese people, but when Nguyên looked back after he asked him to stop, he didn’t know how to ask him, even if he knew how to say it Nguyên probably wouldn’t understand, and the words of the barmaid resurfaced in his mind, so he shook his head and apologized, saying it was nothing, Nguyên just turned back and around and continued walking. Nguyên suddenly turned around and grabbed him with both hands by his collar, he was a little scared but he didn’t offer any resistance as he pushed him up against the dark wall. Nguyên seemed a little taken aback by his lack of resistance, and by how he seemed defeated and ready and willing to take his punishment; Nguyên’s eyes glared into his own, he didn’t want to see the grief and rage in Nguyên’s eyes so he closed his eyes, he could feel Nguyên’s face hovering just inches from his own, and he braced himself for a punch, he waited there without any malice towards him, but after a while had passed, nothing happened, he opened his eyes again and saw Nguyên’s face was still before him, but the rage upon it had completely disappeared, there was a strange light of warmth emanating from his eyes now, as if their lips were about to meet in a kiss, whereupon they both were slightly taken aback but became more relaxed at the same time, turning their heads away. Still in darkness, with the endless clamour of the merrymakers not far away, they stood there like broken-hearted lovers; Nguyên leaned towards him and said: “Sorry.” He stretched out his hand and pulled him by the hand to where the bike was parked, the warmth and firmness of his grip steadied his mind. He even wished he was the Taiwanese man who had stolen away Nguyên’s lover with money, so that he could express his remorse in front of him now and try to atone for things, but Nguyên had seemingly already decided not to give him this chance, this crowning glory. The honour that he’d almost been given had torn itself from his body. Being nailed to a cross is not an honour that is easily won. When they were back soaring along the road again, he suddenly felt weak and grabbed hold of Nguyên warm waist again, at that moment his waist was like a sacred temple which no filthy hand could profane, he held on to the waist of Nguyên pants without touching his skin; Nguyên was still hammering away at the horn every few minutes, unaware of all of it, which made his spirits sink. His eyes started to drift and he noticed the scenes they were passing, he felt a little sad as he noticed they were heading in the direction of the hotel, Nguyên seemed to realize what he was thinking, grabbed his hand and put it on his waist, amidst the blasting wind and the roar of the engine he sank into the warmth of Nguyên’s body. He felt a little touched, and didn’t know what to say, so he took out his business card and gave it to him, when Nguyên lowered his head to look, he felt a sudden urge to kiss him, so he pressed his lips on Nguyên lowered forehead, Nguyên flinched a little but didn’t leave, afterwards he didn’t make eye contact and lowered his head, busying himself stuffing his business card into his wallet, then started up his motorcycle and left. As he watched, Nguyên disappeared into the darkness of the night, he noticed a photograph that seemed to have fallen from Nguyên’s wallet; he picked it up to look at it, it was a picture of Mary holding the infant Jesus, she was smiling with warmth and compassion. That night he dreamed several times of Mary smiling at him. As the plane rose above the clouds, the sun shone from the back of the plane, layers upon layers of cloud, both light and dark appeared at once. He thought about this morning, when he had walked out of the hotel after settling the bill, and had seen Nguyên standing there waiting for him by his motorcycle in a particularly clean-looking white suit of clothes, they both laughed timidly at each other; Nguyên came and took his luggage, and tied it carefully on to the back seat with rope, then without saying anything they straddled the bike and left. He knew that the airport was too far and he shouldn’t have gone by motorbike, the manager of the hotel was aghast when he refused his offer of a taxi and said he was going by motorcycle, but it had been like a promise between them, an unbreakable trust. As the bike left downtown Hanoi, the dust on the road gradually rose behind them, the road was bumpy here and hard to navigate. They tacitly vowed to plough on despite the difficulty; at both sides of the road was the endless inky green of rice fields, the still tender golden ears just emerging. A man led an ox calmly through the field, and he imagined it was Nguyên working in the field, his wife and son on the embankment at the edge of the field waiting expectantly to return home. As the bike hit another bumpy patch he grabbed on to Nguyên’s waist again, and closed his eyes until they arrived at the airport. After they had said goodbye he walked into the airport, he felt like Orpheus, warning himself not to look back, but he couldn’t help himself catching one last glimpse of Nguyên’s turned back; he looked around, to see Nguyên gradually disappearing in the searing white heat of the day, he really wanted to call out to him just like Orpheus singing his wife’s name. He didn’t reply, and turned his head to face the window; he remembered that the guy in Taipei had once told him that the trinity was a big lie, when he had asked why, he’d replied that the bible doesn’t mention anything about it. He cast his gaze upon the layers of clouds, which were constantly shifting in colour with the onset of dusk, thinking to himself that right now he was tens of thousands of meters up in the air on his way back to the guy in Taipei, and Nguyên was most likely ringing endlessly around Hoan Kiem Lake, and then after a few days he would go on the road home, he would do a four-hour stretch until he got there, without saying a word, some people had to spend five hours going home. He had to go home and help his mother and his wife with the rice harvest. He would ride the four hours home, help out for ten days and then drive four hours back to Hanoi, then next year, after being a motorbike driver for another year, he could become a full-time farmer, one day his son would grow up, and would go into the fields to help him. Just one more year and he would be home. This entry was posted in Home, My translations, Taiwanese authors, Translations, 中翻英 Chinese to English and tagged china, Chinese, Chinese colonialism, Chinese Literature, Chinese to english, 阮慶岳, 越南, Gay, Roan Ching-yue, Southeast Asian brides, taiwan, Taiwanese literature, translation, travel, Vietnam, 台灣同志, 同志, 同志文學, 哭泣哭泣城, 文學, 東南亞配偶, 中翻英, 中國殖民主義 by ladenframe. Bookmark the permalink.